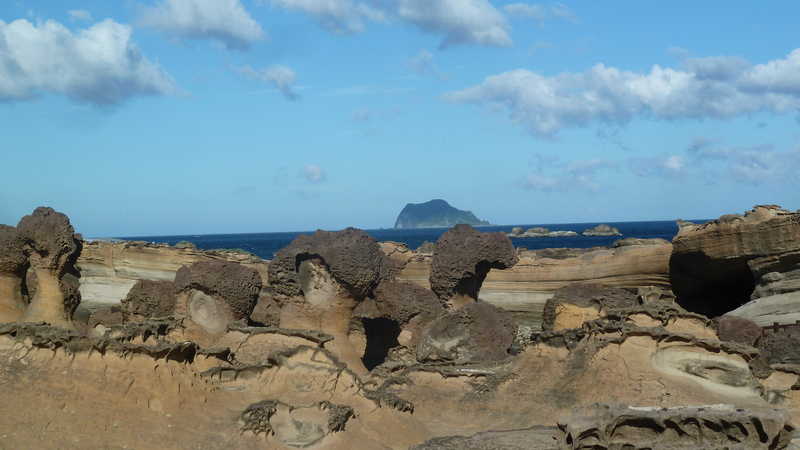 One of my earliest childhood memories of Taiwan, besides the astounding heat and humidity in the Summer, is of the fantastical rock formations at Yehliu 野柳. Until our trip back this summer, I hadn’t been there is more than thirty years. Located on Taiwan’s Northern Coast just north of Taipei, Yehliu is a cape located in the town of Wanli. It is famous for a collection of rock formations which are accessible to visitors through the Yehliu Geopark, part of the Guanyinshan National Scenic Area. 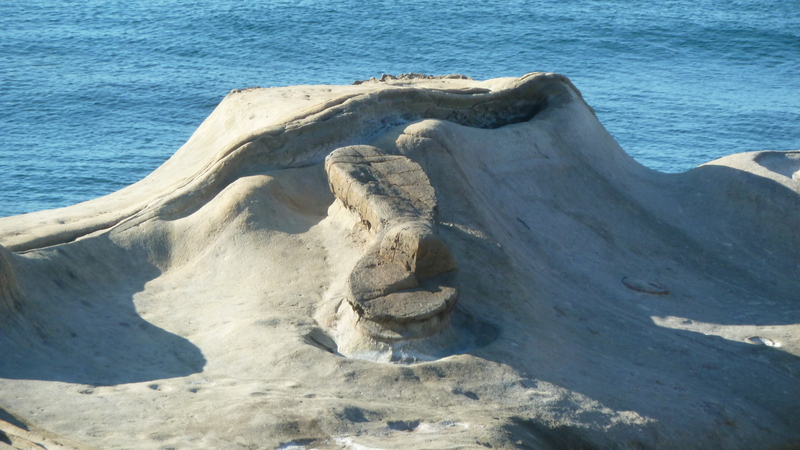 There are dozens rocks in shapes which have been given fanciful names depending on what they resemble; some are obvious, others are sort of a Rorshach test. The Yehliu cape, known by geologists as the Yehliu Promontory, forms part of the Taliao Miocene Formation. It stretches approximately 1,700 meters into the ocean and was formed as geological forces pushed Datun Mountain(大屯山) out of the sea. These stones are known geologically as hoodoo stones. Hoodoo stones, otherwise knpwn as tent rocks or fairy chimneys, are tall, thin spires of rock that protrufe from the bottom of an arid drainage basin, usually in the desert. 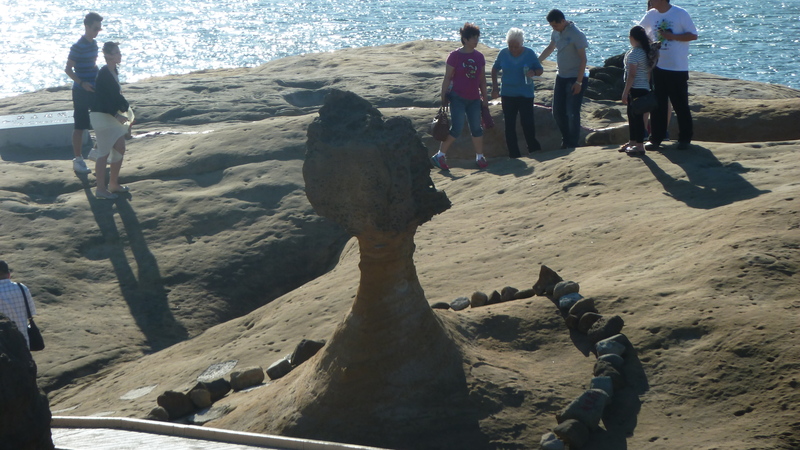 The hoodoo stones in Yehliu are unusual for their coastal setting; they formed as the seabed rose rapidly out of the ocean. Hoodoos consist of relatively soft rock topped by harder, less easily eroded stone that protects each column from the elements. The most iconic of Yehliu’s formtions is the Queen’s Head (女王頭), which is early days truly resembled the profile of Queen Elizabeth on British coins. I say in early days, because she is no longer in her full glory. As with many return visits to childhood memories, this one was bittersweet. 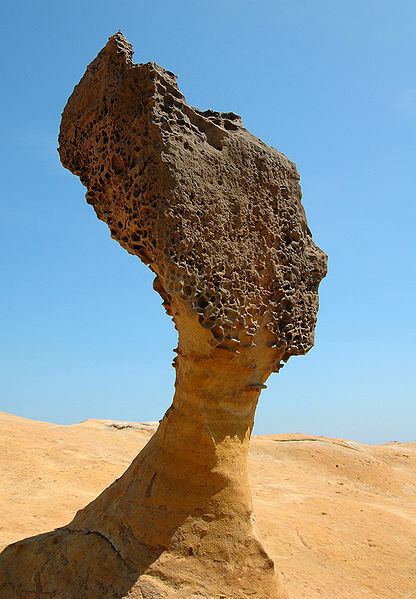 A combination of natural erosion by wind and sea and unnatural erosion by human touch has whittled down many of Yehliu’s famous formations into near oblivion. The Queen’s Head is probably the biggest victim. My parents posed next to the Queens’ Head for their engagement photo in the early 1960s, and at that time she had a robust profile, now whittled down to a spindly neck which geologists predict will likely topple in the next few decades. The circle of stones is all that protects the Queen’s Head from the loving touch of her hordes of admirers. Other favorites include the Fairy Slipper, which I remembered calling a flip-flop. This one is out of the way of tourists, so remains the same as I remembered it. It was the end of a spectacularly hot day when we toured Yehliu, and by the time we approached the Queen’s Head, my kids said they were too tired to take those last few steps there. They changed their minds when I told them them that the next time we come back to Tawian, she might be all gone. 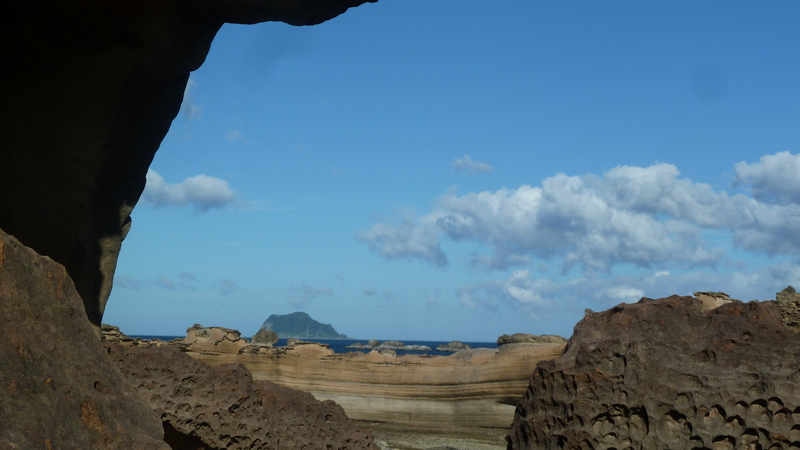 Yehliu is definitely on my shortlist to Taiwan– get there before these are all blown away. Thanks for coming by and reading. If you enjoyed this, please leave a comment and also share this with your friends. Please come back soon for more posts on Taiwan. Those rock formations are really beautiful and fantastical. They really are amazing! I hope to get back in sooner than thirty years this time! 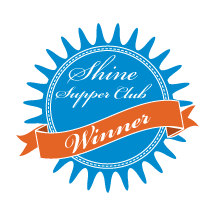 Thank you for sharing your journey and photos! I remember these rock formations from a childhood trip to Taiwan too. I remember the glorious Queen’s Head back then and am sad to see what it has become today. Bittersweet, indeed. It was a real shock to see– at first I thought I had glorified the Queen’s Head in my memories, but a look at my parents’ engagement photo (which I wish I had scanned) verified how different it used to look. Go soon! Yehliu is so cool, although my last trip there involved a really unfortunate number of jellyfish. Next time I’ll stay out of the water!